Still, the potential gains of active speakers are plenty. Each amplifier will be able to drive each speaker directly, which promises better efficiency, better dynamics and lower distortion. The crossover can function more precisely, as it isn't directly affected by the drivers anymore. The only problem is the fact that you need at least 4 power amps and an electronic crossover, and that can add considerably to the cost. On the other hand, you don't need a passive crossover anymore, and you no longer need a separate power amp. In the end it could even be cheaper. The AS2.100 units under review here are certainly trying to make the case for active speakers. Hypex is very well known for their innovative class-D amplifier modules, reviewed earlier on TNT, which are used by many other manufacturers. 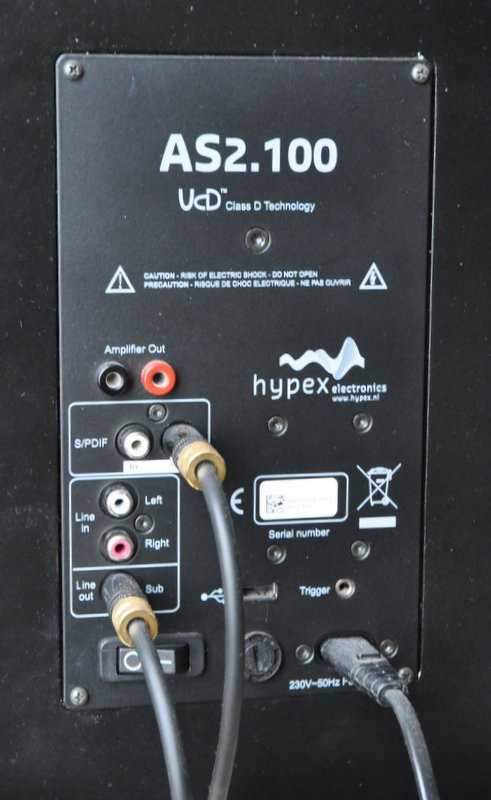 Hypex are a clever bunch and their amps are small and efficient, so the ideal candidates for active loudspeaker systems. The AS2.100 is a very compact unit that contains all the electronics to build an active system. This means it not only has two power amps per side, but also two ADCs, two DACs and two DSPs (digital signal processor). This means that these units can convert a signal to digital, apply some fancy filtering and then convert it back to analoge and amplify it. In addition you can also send a digital signal straight into the DSP, bypassing the ADC. This digital signal can be provided as SPDIF or through a USB connection from a computer. The digital input does require an optional extra input board, which was installed on my review samples. The two amps are 50 watts each, which is more than enough, certainly given the fact that they drive the speakers directly, without a passive crossover draining part of the power. This will allow the bass amp to use its full damping factor on the bass driver, giving it the control of a bigger amp. Driving a tweeter directly gives much higher efficiency and prevents problems at the tweeters resonance frequency as well, because in most passive systems the tweeter is attenuated by a resistor network to make it match the sensitivity of the woofer. In the end, these two 50 watt amps are a lot more effective than the equivalent 100 watt amp on a passive version of this speaker. You'd probably have to use more like double that to match this system. Cool! 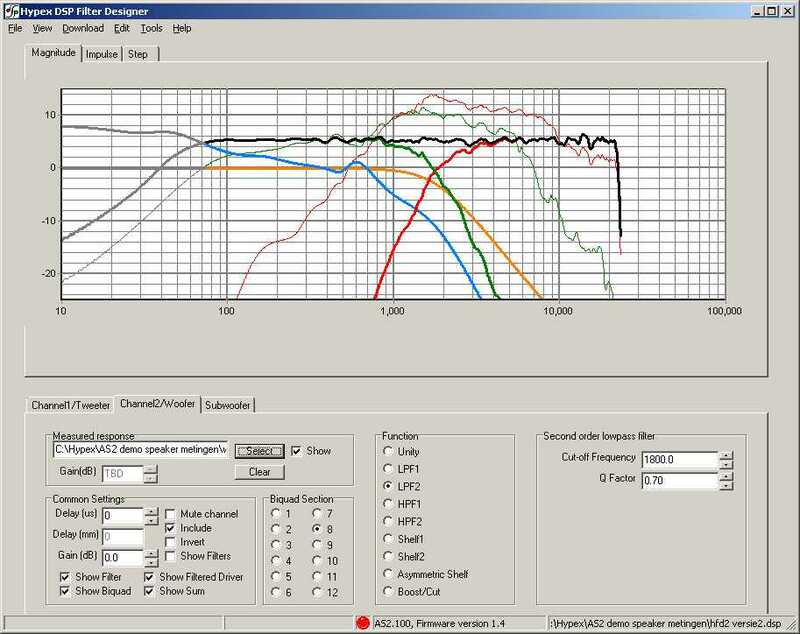 The actual crossover can be implemented using the accompanying Hypex software, which allows you to specify filters for the tweeter and woofer section separately and then see the simulated summed response of the whole system. Obviously, you will need a microphone to make measurements of the individual drivers to be able to do all of this. In my case these measurements were already included, so that made life a bit easier. Clearly, the final results will stand or fall depending on the quality of these measurements. You don't need an anechoic room for this, but you do need to use a decent microphone. To optimise the response a whole range of filters can be applied: low-pass, high-pass, shelf, boost and many others. I cannot really imagine anyone needing more than is provided. The signal to the tweeter can even be delayed to time-align it with the output from the woofer. Each unit also has an analoge output for a subwoofer. This can be set to output either the left channel, the right channel or the sum of both. In addition there is the option to filter the sub output too, but the DSP for that is a little bit more basic. Mind you, it's still far better than the standard controls of most subs. If you add another pair of amplifiers this sub output will even allow you to build a full three way system. The filtering is even flexible enough to allow for some proper room correction. Not to the same extend as some dedicated systems, and you will have to do it by hand, but this could still be extremely interesting if your room has a very strong resonance or colouration. My current room doesn't have any problems that require correction of this kind, so I cannot comment on the effectiveness of room correction with the AS2.100. 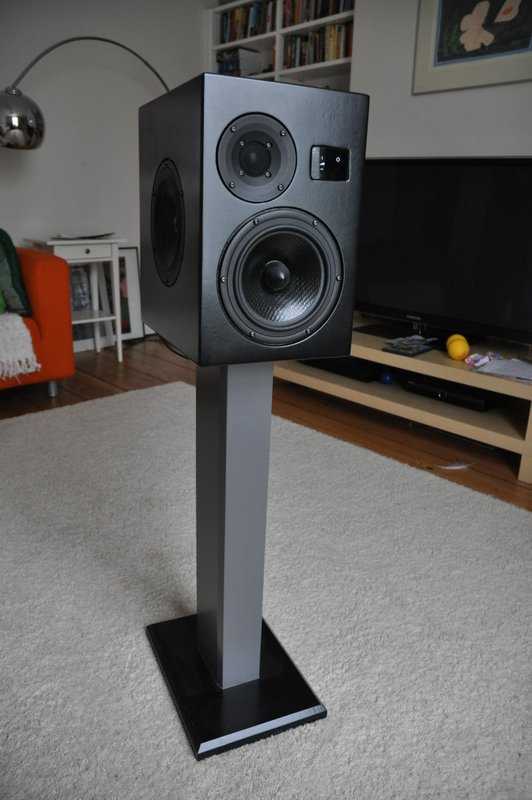 I was sent two complete loudspeakers, built with SEAS drivers and including matching stands. They use the Seas 27TBCD/GB-DXT H1499 metal dome tweeter with DXT lens, the Seas U18RNX/P H1571-08 6.5" woofer and the Seas SP18R H9944 passive radiator. The radiators are mounted in the side of the speakers, and the actual AS2.100 unit sits at the back, in a separate compartment. These are actually demo speakers built by Hypex for audio shows and are not available for purchase. If you want a system like this, you will have to build your own. This shouldn't be more complicated than building a pair of passive speakers: just replace the usual passive crossover with an AS2.100 and you're done. The main advantage is that you can now specify any crossover you want, and experiment with as many variations as you like, something that is very difficult with passive systems. One of the speakers will be set to be 'master', and the other one 'slave'. 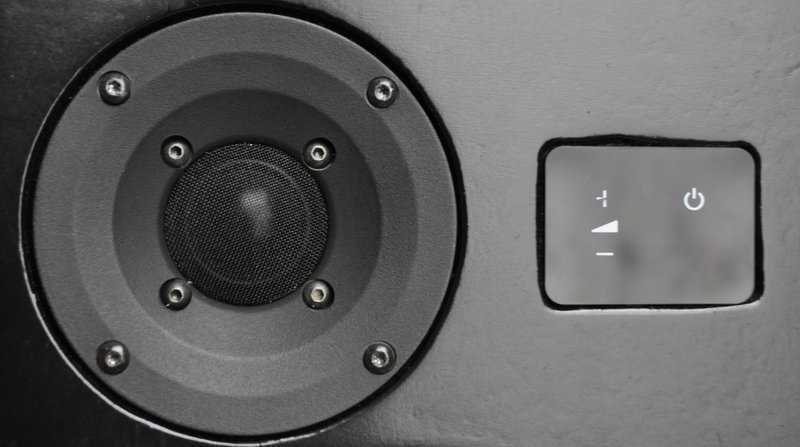 The master speaker has a little panel at the front allowing on/off switching and volume control. This can all be done with the remote control too, but there's no indication of the source or volume selected, however, so you have to be careful not to make a mistake. It does feel really strange in the beginning, but the only other thing you need in addition to these two speakers is a source. This can either be an analoge source, or a digital one, or even a computer using the USB input. I used the digital output from my Astin Trew At3500plus CD player, and this worked very well. In practice the system takes a little while to get used to, I have to admit. When the speakers arrived they had lost their filter settings for some unknown reason, and it took me a while to get things working again. Uploading filter settings to the speakers is a little bit tedious, but once you know how to do it you can upload new settings in 5 minutes or so. Fiddling with the filter settings is also not too complicated, once you know how to do it. When you have decent measurements you can specify all the filters you like. In practice I found that changing crossover settings didn't affect the sound as much as I had expected. I did make sure that the crossover region was always nice and flat, within +/- 3 dB or so, and that the overall response didn't deviate from flat too much. Adjusting the overall tonal character of these speakers is easy, and has a very clear effect. It doesn't take long to get them precisely as you want them, in my case slightly warmer than neutral. In theory you can adapt the filter settings to any listening situation, but in practise this is a bit too complicated. Both the development of a new setting as well as loading it up to the speakers is too complicated to be done regularly. It would be fantastic if more than one setting could be stored and selected with the remote! Once everything is properly set up operating the system is simplicity itself. Switch them on with the remote, put a CD in your player and press 'play'. That's it. Changing the volume is also easy, with the same remote. The lack of volume and source indication is a bit annoying, but not a real problem, I found. Then again, I only used them with a single source, so that might be different if you use all three possible sources. My usual speakers are either Dynaudio Contour 1.8mk2 or Seas Exotic full range, used with either my Django pre and Usher R1.5 power amp or my Icon Audio Stereo 40 mk3 integrated amplifier. Compared to those speakers and amps this Hypex system sounds distinctly different, to say the least. I do have to add that all these options together represent passive crossovers (Dynaudio), active crossovers (Hypex) and no crossovers at all (Seas). The amplification includes valves (Icon Audio), transistors (Usher), transformers (Django) and class-D (Hypex). There are also sealed enclosures (Seas), ported (Dynaudio) and passive radiators (Hypex). In short: almost everything under the sun and plenty of opportunity to confuse myself! I started with the standard factory filters and this produced a fast, clear, very dynamic and extremely punchy sound, that was slightly on the bright and analytical side. Especially bass was remarkable: deep, powerful and with outstanding texture and drive. Given that my Usher power amp is a bit of a bass miracle, it was nothing short of surprising to find it basically beaten by these small speakers. Macro dynamics are something special too. You can keep turning the volume up on these speakers and the sound just gets louder and bigger, seemingly without any limit. In combination with the fantastic bass this makes it an exceptional party loudspeaker, that's for sure. There's also amazing grip and it doesn't matter how loud and wild things get, the sound always stays composed and in control. This is all precisely what you would expect from an active system, so no surprises there. But I have to admit I was quite blown away by the overall quality of the sound, relative to the price of this system. 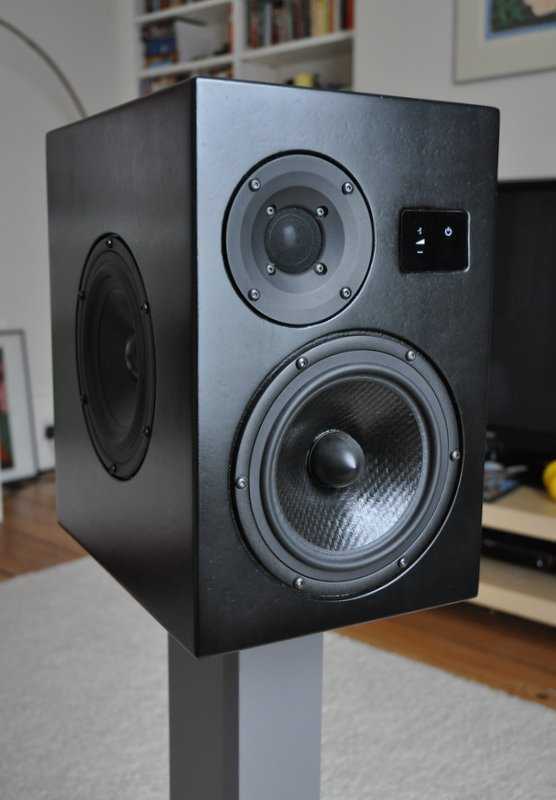 Especially with big orchestra or loud rock these standmount speakers really are unbelievable. With the factory filters they do sound a little bit analytic, but they compensate for that with great engagement and an ability to kick life into almost every recording, simply by enabling you to turn the volume up without this resulting in harshness or compression. I did fiddle with the filter settings and found that I was able to improve the factory settings a bit. I started by removing a couple of filters that lifted the top end of the tweeter and the upper frequencies of the woofer. I suspected they were not needed and doing more harm than good. The sound did indeed improve, becoming slightly warmer and a little bit more refined and sweet. I did improve things a little bit further by introducing a mild midbass accent to proceedings. I added a filter to the woofer section that boosts the sound at 200 Hz, with a very wide spread so that the top end was now about 2 dB down and the bass about 1 dB. This made the whole sound warmer without becoming too boomy and also improved drive in the lower regions. When played very loud this turned out to be a bit much, but at normal levels it made things considerably more enjoyable. Basically, you can tailor the response of this system to your personal preference, so you should always be able to find a tonal balance that suits you. You'll have to be prepared to fiddle with the filter settings, though. So, lots of good news, but sadly there are also a few slight disadvantages. The main problem, to my ears, is to do with the soundstage. With the provided filters I was always left with a gap in the middle of the soundstage. My modifications to the filter settings improved things a bit, but didn't solve the problem completely. Only sounds that project very far to the back of the soundstage are actually presented in the middle, but all else is coming more or less from the speakers, or outside of it. In extreme cases I heard sounds coming from meters outside of the speakers, or even completely from the side of the room. None of these sounds were supposed to come from these directions. I have never encountered this before. Imaging and focus were equally compromised, with sounds in the middle particularly affected. Central images are a bit unstable and difficult to pinpoint, leading to a slightly 'hollow' sound. Soundstage is also very dependent on location, with only the absolute middle 'hot' seat being more or less acceptable, but when you move even a little bit to the side it all falls apart. It depends on your preferences how much of a problem this represents, but I can only say that I don't like it very much. Having said that: these speakers have so much to offer that I'm actually willing to forgive them a fundamental flaw like this. During normal, day to day listening it actually isn't that obvious, but the moment you sit down for a proper bit of music it becomes more of an issue. Resolution is fine, but the overall sound isn't very refined, at least not compared to my valve amp and Astin Trew CD player. The effect is a little bit like oversharpening a digital photo or television. And, yes, this complete Hypex system costs less than any of my components individually, so I'm not being completely fair here, but the truth is that the Hypex speakers can sound a little bit raw and edgy at times and remind me strongly of the sound of a budget CD player, but certainly a good budget CD player, don't get me wrong. This is only to be expected, given the price, but still a bit of a shame given their fantastic performance in other areas. These speakers do like to be played loud. Actually, make that: these speakers almost force you to play them very loud, all the time. They simply need high volume to kick some life into them, and they can be slightly uninvolving at lower settings. No background music or quiet late night session with these: you'll be jumping around the room playing the air guitar instead. This can be a little bit annoying, especially for your neighbours. This is a DIY solution only, as the speakers are not for sale, just the modules that do the active filtering and amplification. 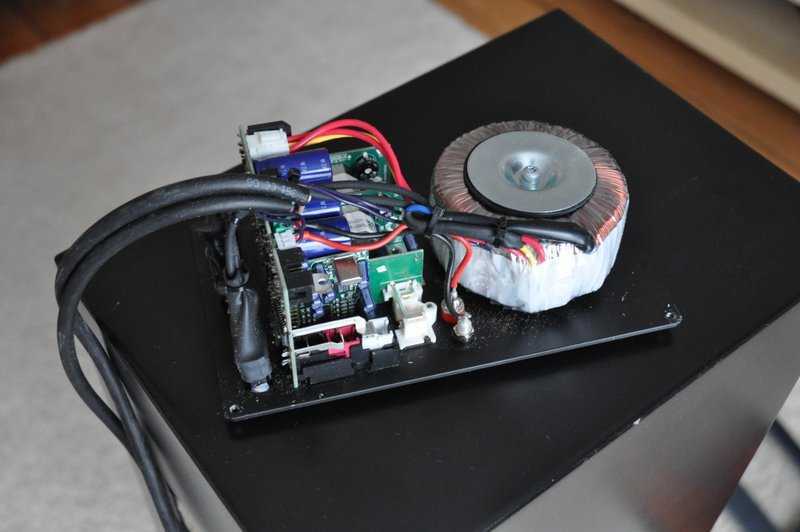 Still, this probably represents one of the easiest and most affordable ways of building your own active speakers, not to mention the incredible flexibility that digital filtering provides. The system that Hypex send me for review is probably a good example of what is possible with the AS2.100 modules. For the money this is an amazing system. Make that an unbelievable bargain if you like to play your music loud and don't care too much about soundstage and imaging. Sadly, with a sound that lacks some refinement and focus these speakers cannot really be called high-end audiophile. This is an absolute shame, as the magnificent bass and impressive dynamics and composure of these speakers is almost as good as it gets. With better digital signal processing and conversion I believe this could be a world class system, but even slightly flawed as they currently are, at this price I cannot do less than recommend them highly. I did enjoy them enormously, and I'm sure you will too.